Companies founded in the mobile age have an advantage. They’ve incorporated mobile from the start. Many companies are now working to incorporate mobile access into web applications and overall business strategy. Mobile can be a difference-maker and a budget-breaker. This post looks at two currently popular techniques to incorporate mobile access into websites and e-commerce: Responsive Web Design and Mobile App Development. Regardless of the choice for Mobile Apps or Responsive Web Design each require significant restructuring or rebuilding of existing web sites, e-commerce processes, and marketing platforms. There is no automated tool to convert web sites into apps or automatically make web sites mobile accessible. Employing mobile technologies will require investment. 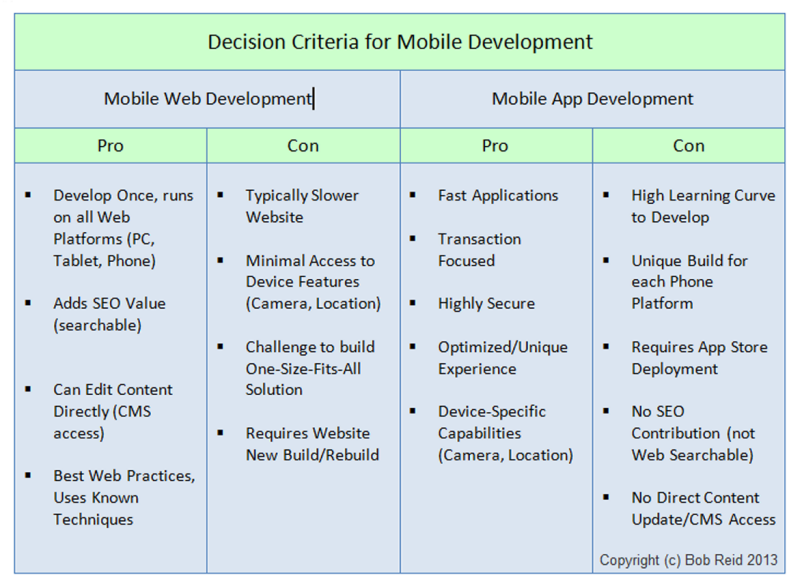 The chart below compares the advantages and disadvantages of Responsive Web Design and Mobile App Development. This is not an either/or decision. You’ll likely want a responsive design for your website and just as likely need an app for secure e-commerce. Some experiences can only currently be created as a mobile app because they make use of phone features (camera, location…). This entry was posted in Mobile, Tech by Bob Reid. Bookmark the permalink.